I have found... through a poll I conducted on this site...that there is a real need for affordable bridal gowns priced around $500. 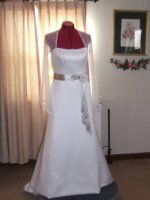 So I searched and came up with a few wedding gown designers that you should consider. The designer collections listed below can hold the key to you finding the perfect wedding dress for the right price. I've listed bridal gown designers whose price point for some of their gowns is around the $500 price range with many coming under that price. In general, you will find that most designers "destination wedding dress collections" will be the most affordable. But if your budget allows for you to go up to $1000 for a gown... then you will find that the designers below will have a lot for you to choose from. Of course there are others such as... WOO2 by Watters and Watters, Cassablanca, Jacqueline Bridals that have a few gowns in their collections in the $500 price range. The designer collections above have a significant amount of gowns priced in an affordable range. So where can you find the above designers' wedding dress collections? "Find the above designers' websites to see their collections or go to an online wedding dress store site like BestBridalPrices.com to search designer collections, the prices and styles." Where Should You Look For An Affordable Wedding Dress? You will find a small selection of affordable wedding gowns in your local bridal shop. Call ahead to see which ones carry the above designers. That way you won't waste time going from shop to shop only to find out they don't carry the collections you want to see. Shop around to compare prices, since they vary from shop to shop. But if you really want to save money the best place to do buy affordable bridal gowns is to order from an online store that discount wedding gowns. Who I recommend to be the best online bridal store to buy discount bridal dresses?